Alberta NDP leader Rachel Notley speaking at an event in Fort McMurray. 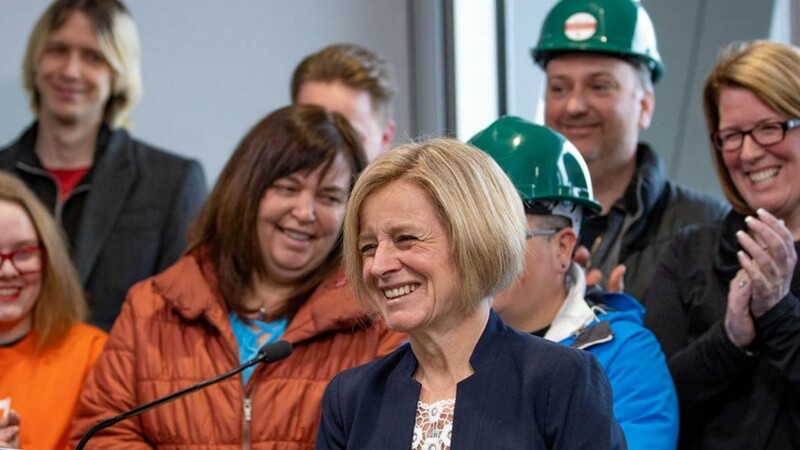 At a campaign event, Notley said the province would upgrade interconnected roads, bridges and utilities across the province. Those roads will ensure that Alberta can move large equipment and industrial components more easily. The upgrades would benefit both oil and gas development in northern Alberta as well as the growing renewable energy industry in southern Alberta. According to the NDP, a six-year program of road upgrades would add 3,500 km to the province's High Load Corridor network, bringing it to 10,000 km total. 7,500 jobs would be created by the roughly $1.4 billion program, the NDP states. Notley also said the NDP would pledge to move forward with the proposed East Clearwater Highway project, which would provide a secondary evacuation route out of communities in the oil sands region. "We will never forget the sight of families fleeing out of the city on Highway 63 while flames licked at the trucks and cars," said Notley. "Fort McMurray needs a second route out and we will get it done." Notley said that the United Conservative Party is considering tolling to recoup the costs of new road construction within the province, and said that the NDP will keep the province's roads toll-free.